With the MBTA set to reopen on a limited schedule Wednesday, the agency’s top official mounted a vigorous defense of its performance through an epic series of snowstorms, as Massachusetts deployed the National Guard and sought snow-removal assistance from eight other states as part of an intensive recovery effort. Following Governor Charlie Baker’s blunt criticism over extensive delays on the mass-transit system, MBTA General Manager Beverly Scott delivered a spirited response Tuesday, contending that old, outdated equipment could not be expected to withstand a rapid succession of severe storms, no matter who was overseeing the system. Public frustration has mounted over the past two weeks over widespread delays, and Baker said Monday he was disappointed with the MBTA’s performance, leading to speculation that Scott’s job was in jeopardy. Scott repeatedly deflected questions Tuesday about her job security, saying a glaring lack of resources, rather than effective leadership, was largely to blame for the system’s problems. 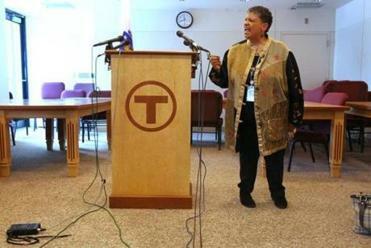 If MBTA general manager Beverly Scott has a bull’s-eye on her back, she hasn’t acted like it. She said she could not guarantee reliable service in the days to come. Another storm could bring as much as 4 inches of snow to the area Thursday and Friday, and temperatures are expected to remain well below normal for the next several days. “I don’t really have any good news with respect to the forecast,’’ said Nicole Belk, a National Weather Service meteorologist. In Boston, city leaders said schools will reopen Wednesday, but the parking ban would remain in effect until 5 p.m. to give road crews more room to operate. Mayor Martin J. Walsh said the city was working to clear major roads and neighborhoods and was expecting to haul away 2,000 truckloads of snow Tuesday night. In some neighborhoods, the city has yet to remove snow from the blizzard last month, and those piles have since doubled. “We’re looking for help all over the city of Boston to make sure that we keep our main streets open and also our sidewalks open,” Walsh said in an afternoon news conference. To make up for snow days, Boston schools will stay open on Evacuation Day (March 17) and Bunker Hill Day (June 17). School is still scheduled to end June 30. As the MBTA canceled rail service and legions of commuters remained snowbound, Baker said the record-setting snowfall in the Boston area — more than 6 feet this year — demanded an emergency response. A day after declaring a state of emergency and closing state offices in Eastern Massachusetts, Baker said he had called up 500 National Guard troops late Monday to help communities that have been overwhelmed by the series of storms. Some used heavy equipment, including front-end loaders, Bobcats, and dump trucks, while others assisted in shoveling out fire hydrants, catch basins, and areas around public safety buildings. Members of the Massachusetts National Guard out of Cape Edwards drove front-end loaders and backhoes through mountainous snowbanks in a south Weymouth parking lot late Tuesday, lifting the snow and dumping it into trucks to carry it to the former Naval Air Station South Weymouth. The Vermont National Guard also pledged to send equipment and personnel to help with cleanup efforts. The state is spending about $555,000 to buy two snow melters that can process 25 truckloads an hour, and asked to borrow 200 additional pieces of heavy equipment from neighboring states. Boston, which received nearly 2 feet of snow in the most recent storm, was also looking to acquire two more industrial snow melters. MBTA officials said rail service would be restored Wednesday, with the Green and Blue lines running on reduced schedules. Officials said they will decide on levels of service for the Orange line Wednesday morning. Red line trains will run only between Alewife and Ashmont stations, while buses will replace rail service between JFK/UMass station and Braintree station. In an animated question-and-answer session with the news media, Scott said slippery track conditions and heavy snow accumulation, which disabled 50 trains Monday, made it necessary to shut down train service. Many of the subway cars have failed because their motors run on direct current power, which easily malfunctions in snow. Transit systems across the country have upgraded to alternating current motors that withstand moisture much better. “This was a perfect storm,” she said. Scott said she had not had any direct communication with the governor, and had never “even had a handshake” with him. But he said MBTA leaders must come up with an operating plan for the rest of the winter and beyond. The MBTA’s board of directors is appointed by the governor, though none of the current members, other than Transportation Secretary Stephanie Pollack, was chosen by Baker. The governor said he works closely with Pollack on the MBTA’s status and operations. 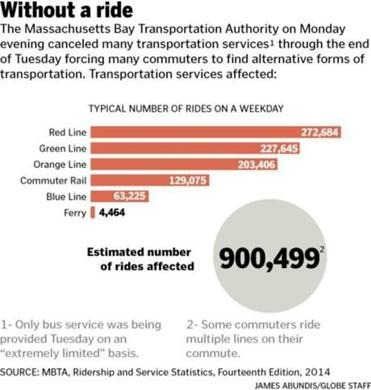 While the T was out of service, other travel improved Tuesday. About 80 percent of flights at Logan Airport were on time, and the state’s highways were in good shape after days of around-the-clock clearing. “It’s wet pavement,’’ said Frank DePaola, head of the highway division for Massachusetts Department of Transportation, describing the roads. He said the state has cleared major highways, but has not yet had a chance to clean off the movable barriers of the zipper lane for the Southeast Expressway. For Boston, the cost of responding to three major storms in the past two weeks is estimated at $30 million, well beyond the annual snow-removal budget of $18.5 million, the mayor’s office said. The storms have been historic, smashing the 1978 record for total snowfall in 30 days with 72 inches. They also combined to break the record for most snow over two weeks, with 64 inches. The winter of 2014-2015 has now vaulted into the top 10 snowiest in Boston’s recorded history, according to the National Weather Service. The worst was 1995-1996, with 107 inches. The heavy snowfall has caused about 20 roof collapses, mostly warehouse-type buildings south of Boston, the area that received the worst of Monday’s storm. While the forecast for Wednesday looked promising — sunny skies with temperatures in the 20s — light snow is expected to arrive Thursday morning, becoming heavier in the afternoon. Much of the state will see 3 to 4 inches, forecasters said. Still another storm could arrive Saturday night. Globe correspondents Taryn Luna and Aneri Pattani and John R. Ellement, Andy Rosen, Andrew Ryan, and Joshua Miller of the Globe staff contributed to this report.